Kirk Schanze studies the interaction of light and organic chemicals, a field that holds great potential for the development of new semiconductors, signaling devices and solar cells. In one project, Schanze’s group is seeking to understand how molecular wires, which are organic molecules that exhibit some of the same properties as semiconductors, interact with light. 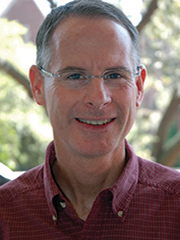 “Although the primary objectives of this program are in the realm of basic science, in the long term the findings of our research could be applied to the development of advanced materials that are used to fabricate molecule-based electronic devices, such as transistors and organic light emitting diodes,” Schanze says. In another project, Schanze and his colleagues are developing materials that would protect military vehicles, particularly planes, from laser-based weapons. “In this program we have recently succeeded in preparing an organometallic material that is more effective in optical limiting in the near-infrared spectral region than any other material that has been tested to date,” says Schanze. The third area of research deals with the development and application of “conjugated polyelectrolytes,” which are fluorescent organic semiconductors that are soluble and processable from water. One applications of these materials is in the area of solar energy.